A wide range of artefacts were recovered during the excavation of Trench 1 in Bone Passage. Some of these items relate to domestic activity at the High Pastures site, while others relate to small-scale industries that were being carried out such as antler and bone working, and metal working. 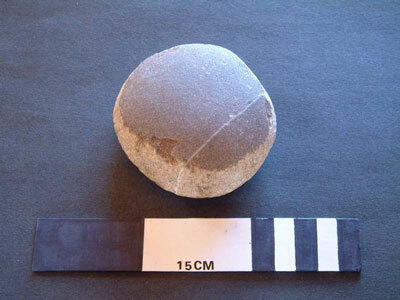 This fragment of rotary quern stone was recovered from the core of the roundhouse wall at the site during planning of the surface structures and is manufactured from granite, a stone local to the area. This type of quern stone was used from the later prehistoric period through into the historical period, and was used to process grain into flour. This fragment is from the top stone of the quern assemblage (the rotary element) and the remains of the funnel-shaped hole can still be seen where the grain was fed in to the system. The top stone would have had a second hole in the top in which some form of handle could be fitted, to turn the stone around its central axis. 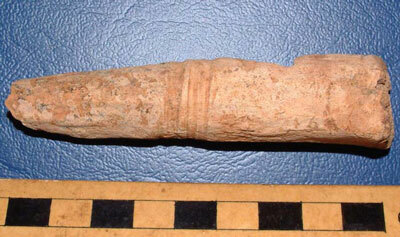 The presence of this item at the site suggests that agriculture was carried out around High Pastures and charred grain recovered from the sediments in the cave passage confirm this. 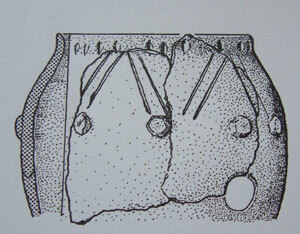 The image above shows to refitting sherds of pottery from a small, vase-type pot. Finger marks from the person who made the pot can be seen on its surface, while the dark residues towards the rim of the vessel relate to burnt food or liquids. The pot is most likely of Iron Age date. Manufactured from a detached tine (point) of red deer antler, this artefact displays a continuous helical groove that has cut into the hard, outer layer of the material. It has been suggested that this item may have been used for stretching out animal skins, used as a peg pushed into the ground. The grooving may have been formed by some form of attachment between the peg and skin (leather thong), allowing the skin to be held tight between several such attachment points. 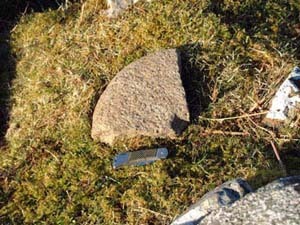 This pebble of Torridonian Sandstone, most likely collected from the local beach at Camas Malag, has been used for a wide range of tasks. It displays evidence of grinding, hammering and possible chopping. 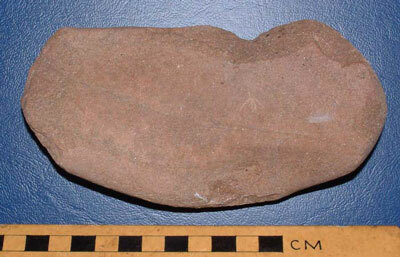 Pebble tools are a relatively common find on prehistoric sites, including those of Iron Age date. The pebble hammer shown above, which is also manufactured from Torridonian Sandstone, displays continuous wear patterns from use as a grinder of some form. This wear has completely removed the upper, smooth layer of the pebble. The sandstone would have provided a good abrasive surface for such tasks. Finally, several fragments of volcanic pumice were recovered from Trench 1, all of which showed evidence of use (grooving and facetted areas). 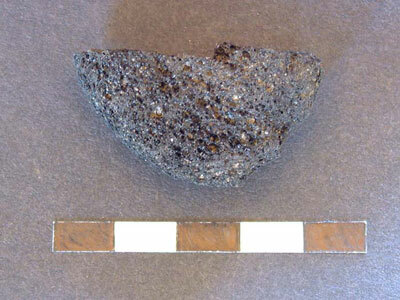 Pumice floats in water and would have been found on the beaches around Skye in prehistory (this material can still be found on the beaches today), and we have good evidence for its use on prehistoric sites extending back into the Mesolithic Period. This material also has good abrasive characteristics and would have been used for a variety of tasks including the working of bone and antler. Dr. Anthony Newton of the University of Edinburgh is analysing the pumice for us from the High Pastures site and will be able to provide a wealth of important information regarding the material such as which volcanoe it derives from and the date of the actual eruption that released it from the Earth! Next entry: Evidence for metalworking from Trench 1, Bone Passage - July 2004.